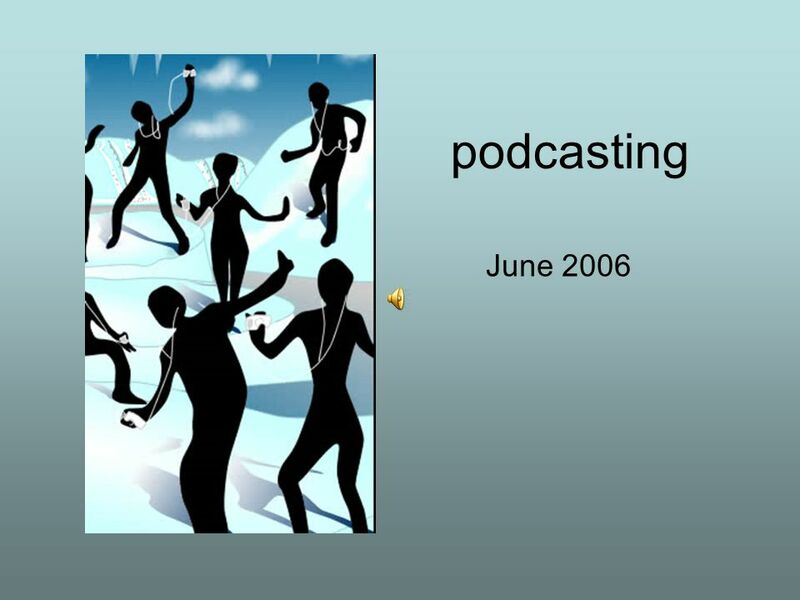 Podcasting June 2006. What is the big deal? 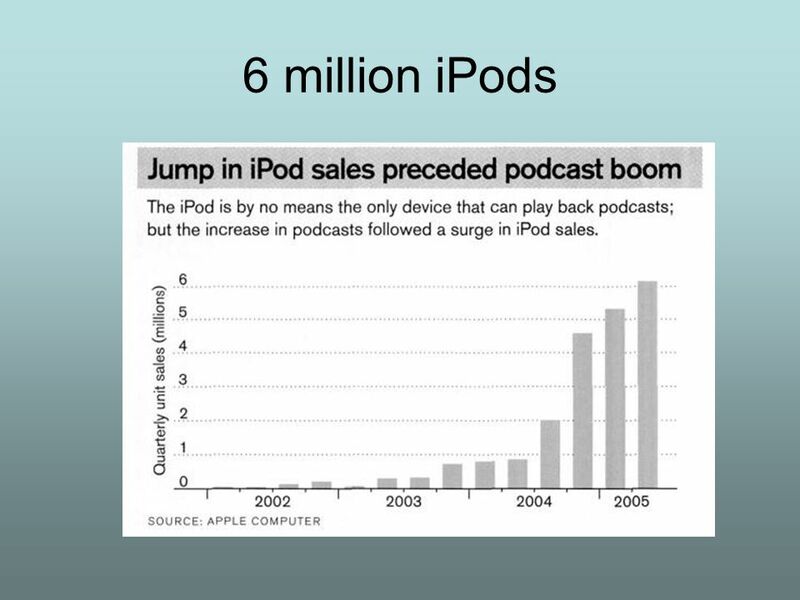 Apple Ipods has captured 78% of the mp3 market. 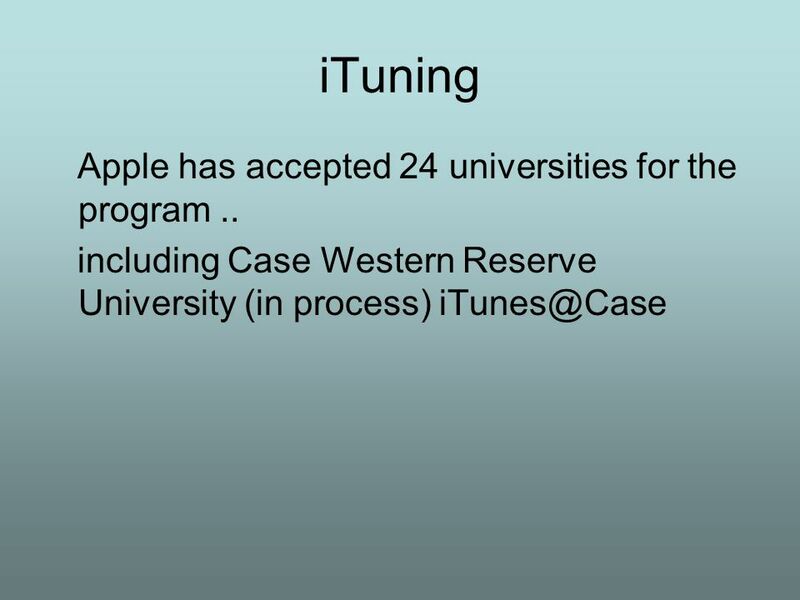 (2005) 73% students rated ipod as #1 “in” thing, overtaking. 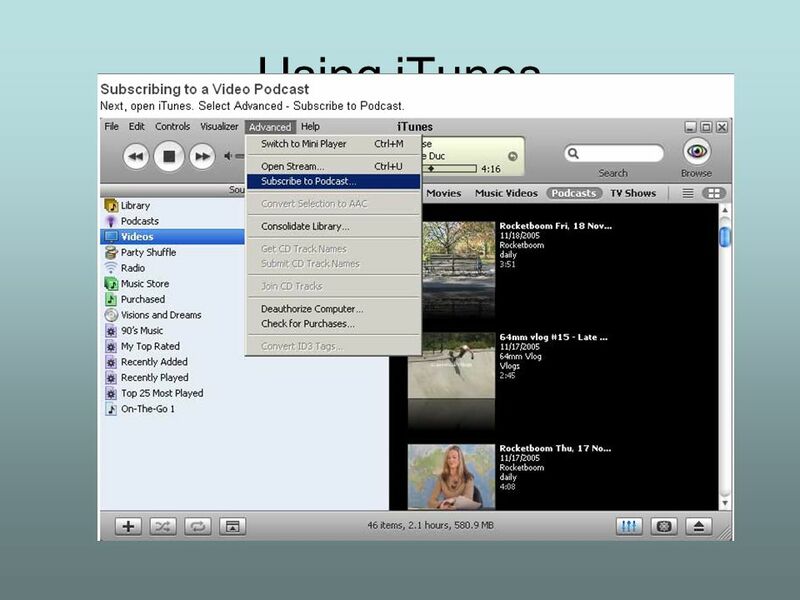 7 How can I subscribe to a podcast? 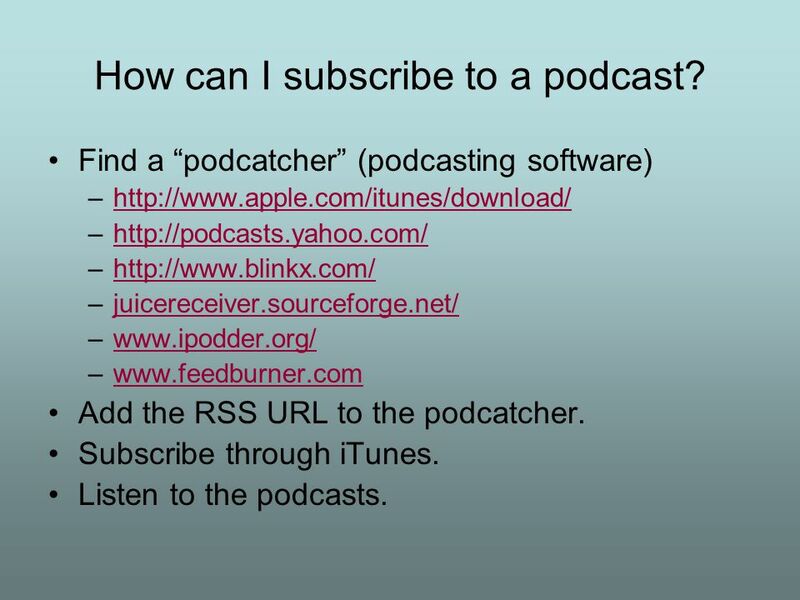 Find a “podcatcher” (podcasting software) –http://www.apple.com/itunes/download/http://www.apple.com/itunes/download/ –http://podcasts.yahoo.com/http://podcasts.yahoo.com/ –http://www.blinkx.com/http://www.blinkx.com/ –juicereceiver.sourceforge.net/juicereceiver.sourceforge.net/ –www.ipodder.org/www.ipodder.org/ –www.feedburner.comwww.feedburner.com Add the RSS URL to the podcatcher. 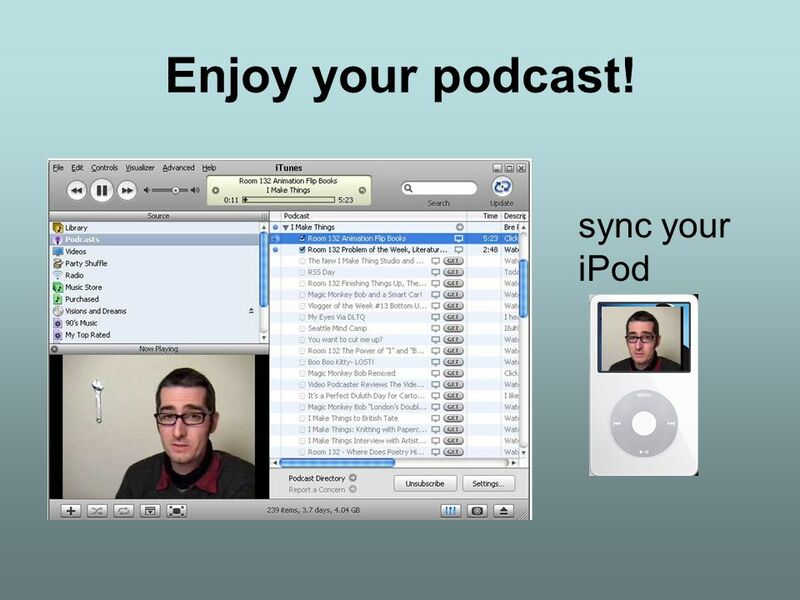 Subscribe through iTunes. Listen to the podcasts. 18 Outside of iTunes University of Nebraska-Lincoln"sound-seeing" tour of campus buildings. 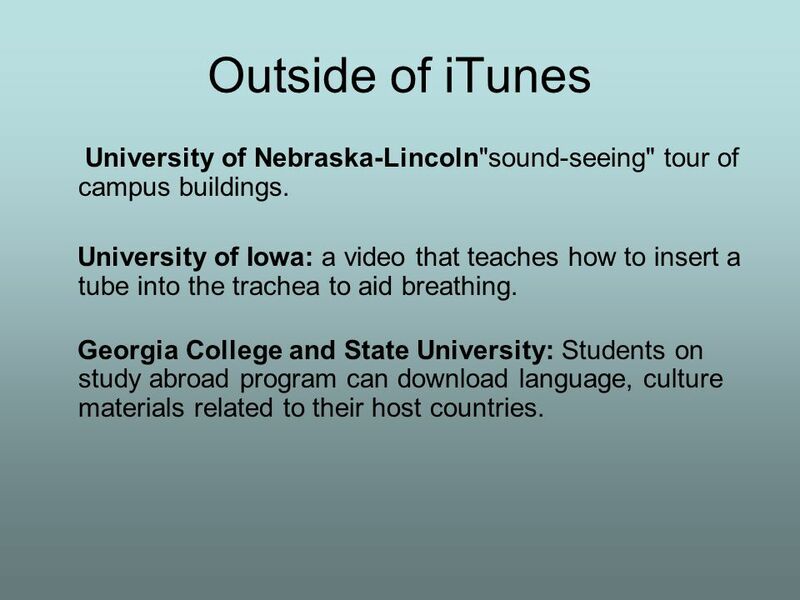 University of Iowa: a video that teaches how to insert a tube into the trachea to aid breathing. Georgia College and State University: Students on study abroad program can download language, culture materials related to their host countries. 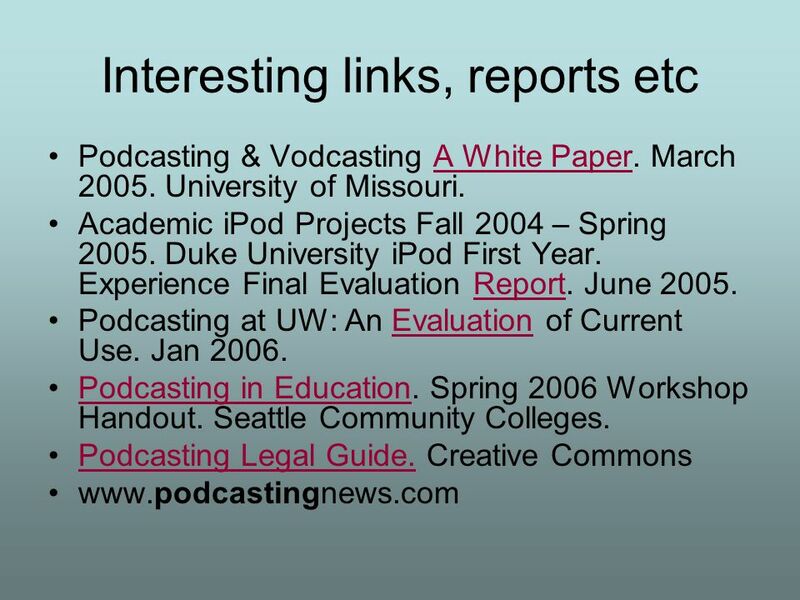 Download ppt "Podcasting June 2006. What is the big deal? 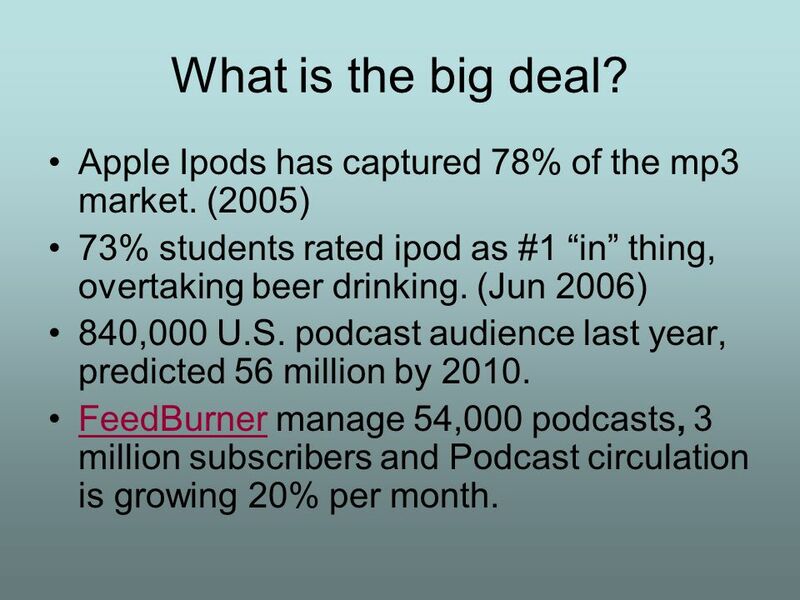 Apple Ipods has captured 78% of the mp3 market. 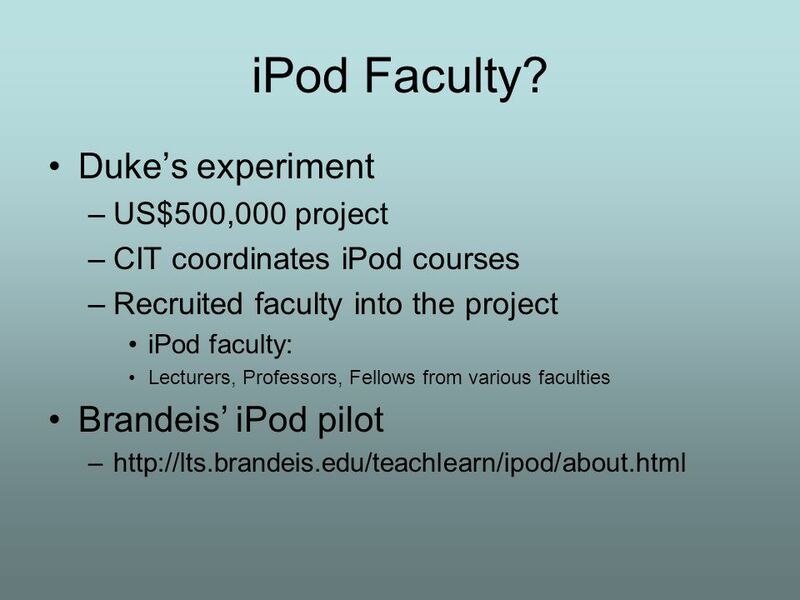 (2005) 73% students rated ipod as #1 “in” thing, overtaking." Intro to Podcasting Kevin Lim at ETC Welcome Introduction to Podcasting Kevin Lim Educational Technology Center University at Buffalo Jim Milles Law Library. 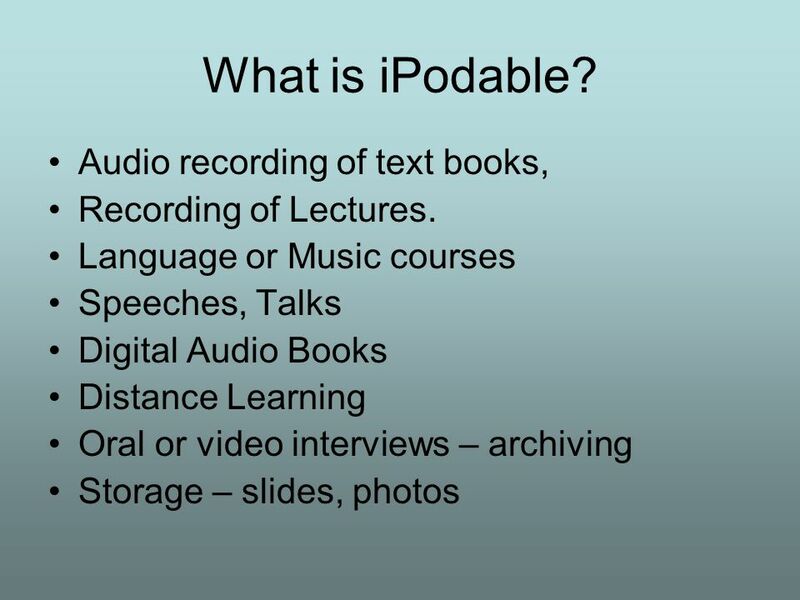 Video Podcasting: When, Where and How it s Currently used for Instruction Abbie Brown, Ph.D. East Carolina University Timothy D. Green, Ph.D. California. Tim Rhodus Professor Horticulture & Crop Science Ohio State University Horticulture & Crop Science.  How was the final?  Questions?  Topic requests? 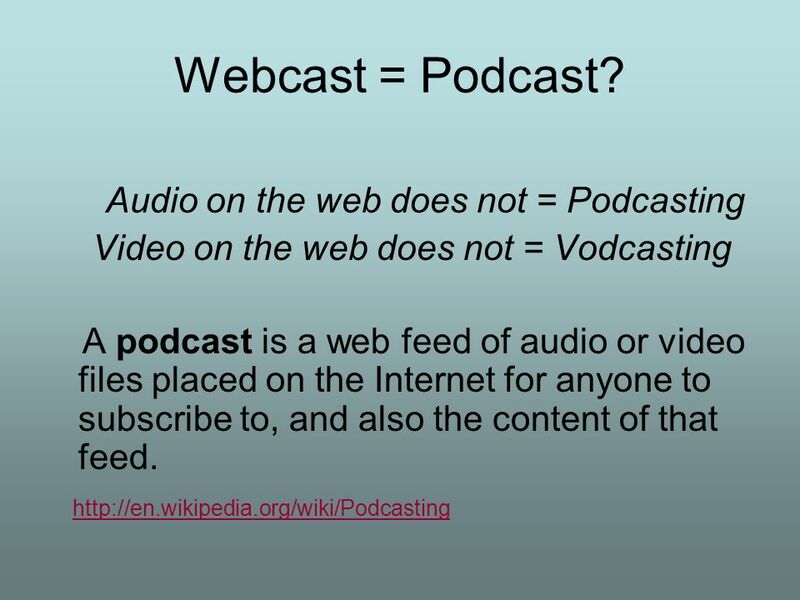 Podcast From Wikipedia, the free encyclopedia A podcast is a collection of digital media files which is distributed over the Internet using syndication. Podcasting Preparing the MP3 File Creating an RSS Feed Validating and Publishing the Feed. 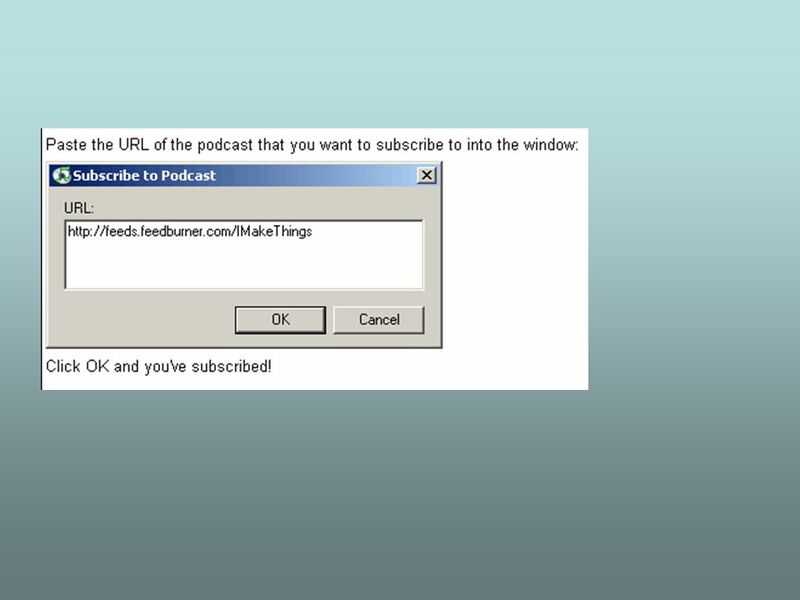 ● Define Podcast & Review Terminology ● Provide an introduction to Audacity ● Download & Install Audacity and LAME MP3 Encoder ● Setup & Configure Microphone. October 1, 2007 RRLC Pizza Workshop Podcasting Kate Pitcher, Reference/Instruction & Web Development Librarian SUNY Geneseo. Podcasting Getting Started with Basics. 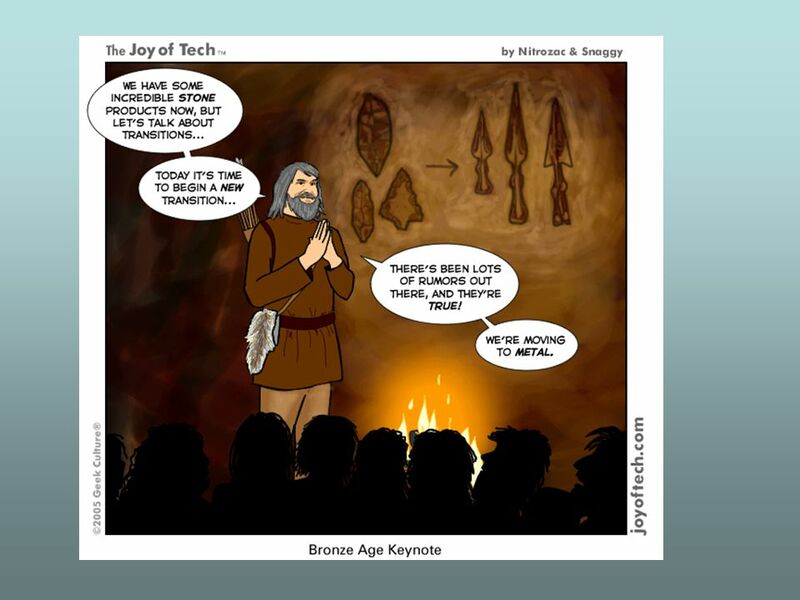 Copyright 2011 CBE/C Johnson 2 Introduction What is it? Who can use it? 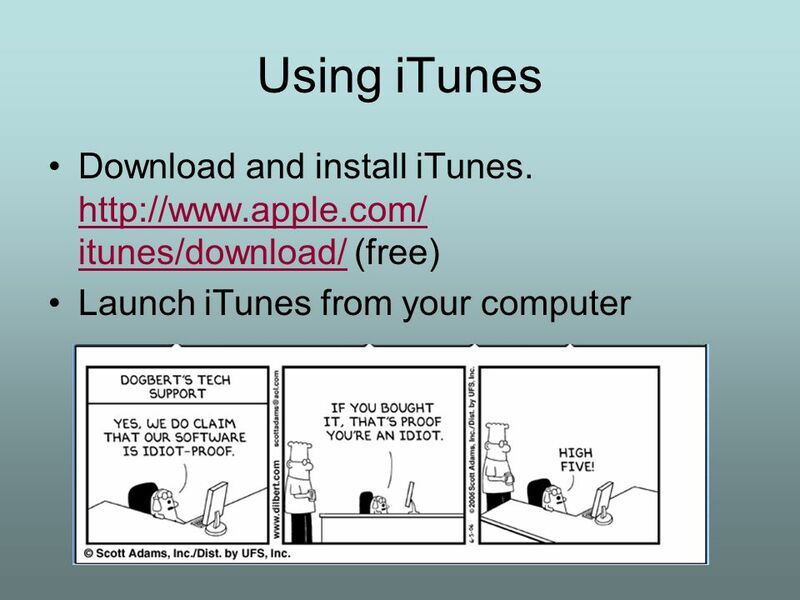 Benefits of podcasts in teaching How do. 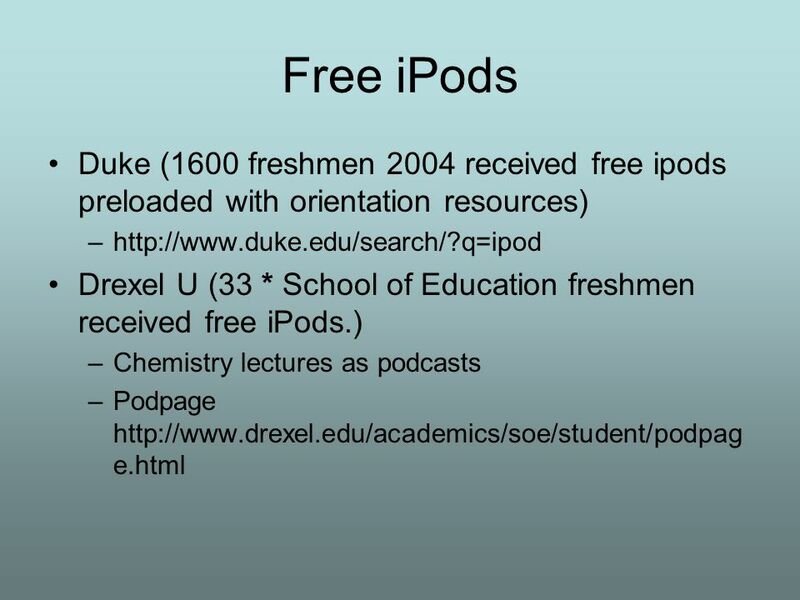 Podcast 101 C. Candace Chou University of St. Thomas Nov. 10, 2010. 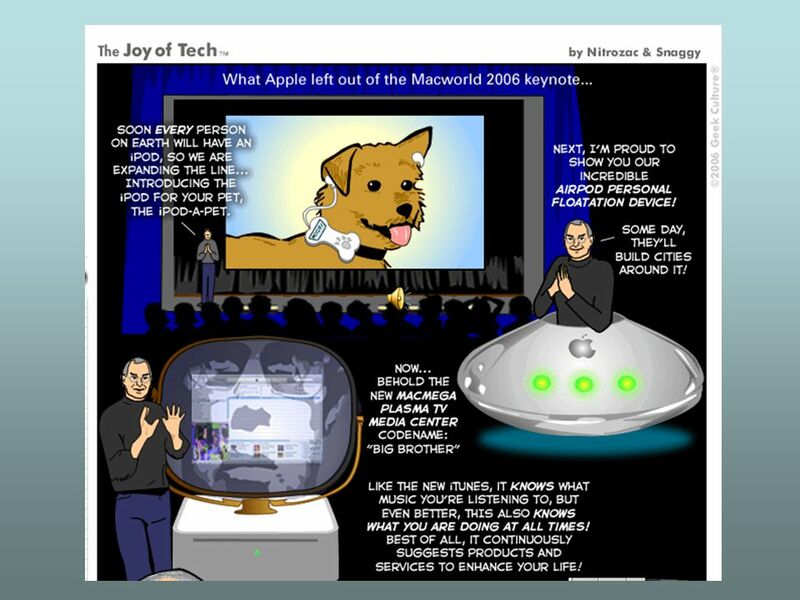  A very natural fit – words and sound! 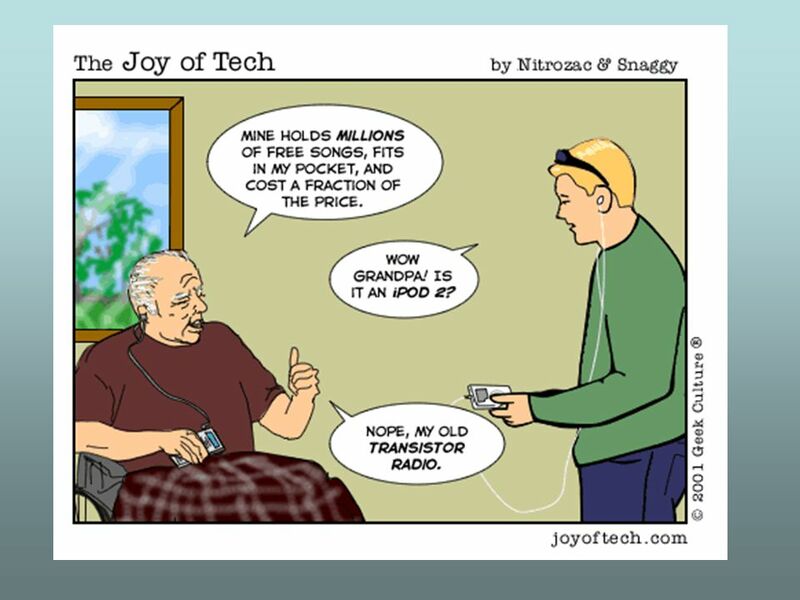  Activates the spoken word  Increases the writer’s audienceaudience  Speakers listen and critique their own. 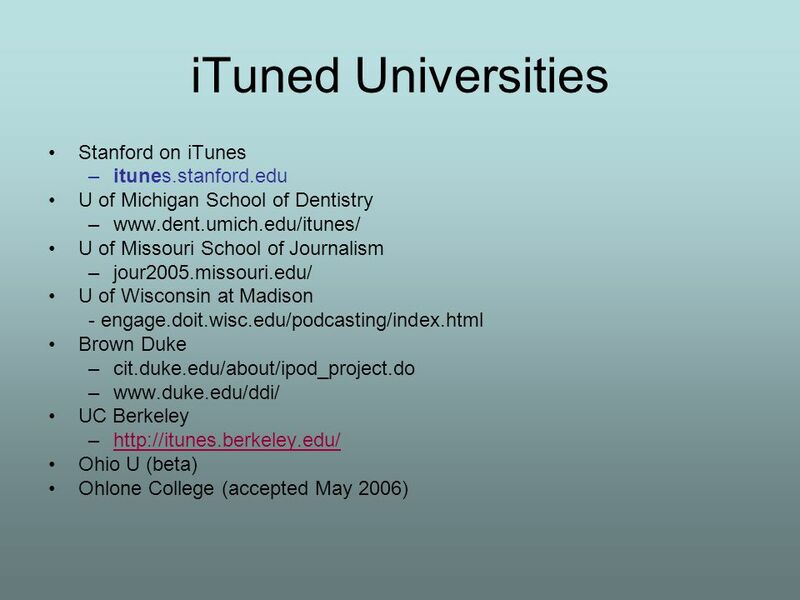 Taking the Lecture Away Screencasting and Podcasting in Small Liberal Arts Colleges. Creating Podcasts. 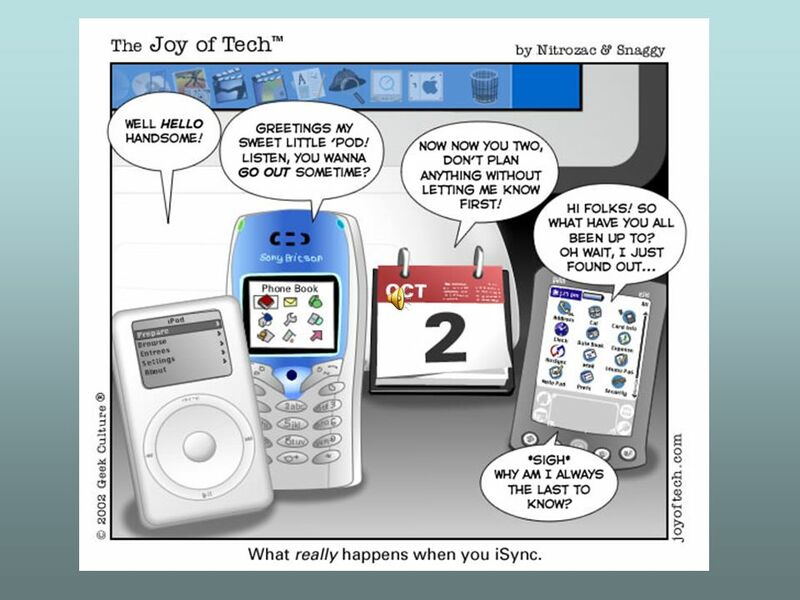 What are podcasts? 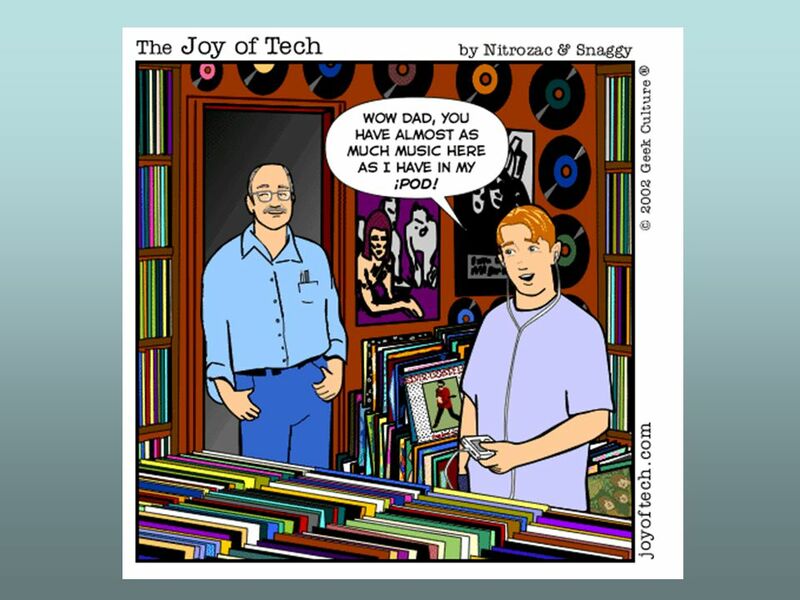 Podcasts are like radio or TV shows that are downloaded over the Internet. 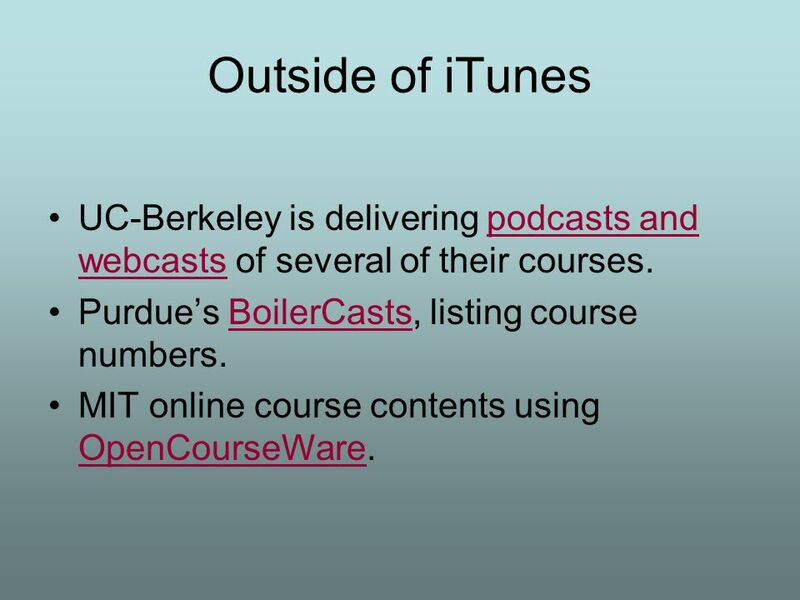 They can be downloaded to iTunes or listened.